Castle Cranshaw has a tough life. His mother works long hours at the hospital to make ends meet, and they live in a rough part of town. His father is absent because he's in jail after attempting to shoot Castle and his mother. On his way home from school one day he spots some kids running races. He sits and watches, particularly paying attention to a boy in fancy running clothes who seems to be the fastest of the bunch. He thinks he's a pretty fast runner himself so decides to race outside the track - in his jeans and rough shoes, and manages to win. The coach convinces Castle - who tells Coach his name is Ghost - that he should join their team. Takes Ghost home in his taxi and talks the mother into giving permission, thus committing Ghost to training after school every day - as long as he stays out of trouble and gets his school work done, or he'll be out. Staying out of trouble is hard for Ghost, who usually reacts violently to people giving him a hard time. When he lands in trouble the very next day he gets in trouble he gets the school to call his 'uncle' - the coach, to come and bail him out. Ghost makes some really bad decisions, and you can see why when you follow his way of thinking. But as the story evolves you see him slowly learning new ways, learning to keep his cool sometimes. Athletics is a sport that's not often featured in fiction. I've been reading a lot of basketball novels, and some soccer, but I like how the athletics is both powerfully individual, but also a team. The writing is rich and real, great characters who ring true and have you on their side, even when they do dumb stuff. 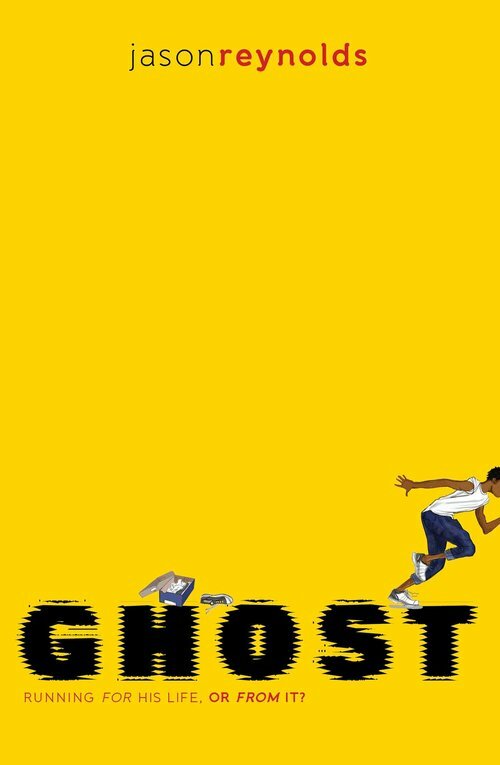 Ghost was short-listed for the National Book Awards and he's had a clutch of awards for other books including the Coretta Scott King/John Steptoe Award for new talent for When I Was the Greatest, and Kirkus Award for As Brave As You, which was also a Times Book of the Year. Ghost is first in a series and I'm very much looking forward to reading the next. I'll be ordering in a bunch of Reynolds' books for my Intermediate school library too. Jason Reynolds website can be found here.